The Linked Learning Patient Care Pathway consists of 6 courses over your junior and senior years. All courses count toward graduation. 11th Grade (3 Courses): Students will need to take 3 courses in order to participate in the patient care pathway. Medical Terminology (CTE Concentration Course): This is a one-year course in which students develop a comprehensive medical vocabulary while developing a deeper understanding of different parts of the body, health and disease, the nervous system, the immune system, and much more. Physiology: This is a one-year course in which students study the function of the human body, cells, organs, and systems. Students will have the opportunity to analyze clinical problems and cases, and students will even monitor some of their own physiological processes. American Literature & Contemporary Composition: This is a one-year course in which students will read and analyze American fiction and nonfiction themed around science and patient care. Students will strengthen their critical reading, writing, speaking, listening and critical thinking skills throughout the year, while being exposed to topics related to the healthcare field. 12th Grade (2-3 Courses): Students have the option to take 2 or 3 cohorted courses. Selection for these courses will take place near the end of 11th grade academic year. Government and Economics: This is a yearlong, A-G required course. Students will take a Government course Fall semester and Economics second semester. Students will have the opportunity to closely examine the U.S. Constitution, the three branches of government, and political parties. Students will also study the economic, historical and social contexts of current events, including healthcare related issues. ROP Health Occupations and Careers A/B/C/D (2-period block, CTE Capstone Course): This is a two-period block of classes taking place at USC Keck Hospital. Students wear a uniform before walking over to the hospital to engage in a professional healthcare working environment. Students will explore the various health careers and occupations within a hospital setting. Sports Therapeutic (1-period, CTE Capstone Course): This is a one-year course designed to provide classroom instruction preparing students for the fitness industry, such as sports therapy and physical therapy. Students will continue their study of human anatomy, physiology, biology and hands-on training in first aid, CPR, nutrition, injury care and management. 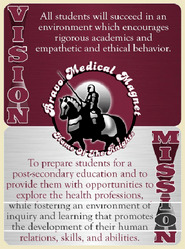 Bravo Medical Magnet High School is a proud Linked Learning school. Bravo adopted the Linked Learning approach to education to expose students to college and career opportunities in the health and medical field. As a Medical Magnet, we have continuously offered our students a rigorous academic program, but we also prepare our students to plan for a possible career in health or medicine as early as the 9th grade. By their 11th & 12th grade years, students have the option to specialize their education and pursue coursework in Biotechnology, Patient Care, and Healthcare Administrative Services. According to the Linked Learning Alliance, "research shows that Linked Learning students have higher rates of engagement and higher graduation rates than their peers at traditional high schools." Linked Learning is helping the educational experience become more relevant and engaging, preparing our students to succeed in their college, career, and life goals. A 2 year program in which students are trained in research techniques (11th grade) and assigned to a research laboratory on the USC Health Sciences Campus (12th grade, 2 hour block periods). Students work on a research project under the guidance of a USC mentor, become familiar with pertinent scientific literature, perform standard analysis techniques, and present their findings in PowerPoint and poster formats. At their USC biomedical laboratory, students contribute to complex problems being studied in fields such as Cancer, Alzheimer’s, Parkinson’s, Medical drugs, STEM Cells, Pharmacology, and many more fields. It allows students to learn and master laboratory skills to test possible solutions to these problems, and to develop written and oral communication skills necessary to communicate their findings. A 2 year program that is very similar to the STAR Program, in which students design several projects involving physics, electrical, mechanical, and chemical engineering projects (11th grade) and are assigned to a biomedical engineering research laboratory on the USC Health Sciences or University Park Campuses (12th grade, 2 hour block periods). The following are some of the USC Departments that EHA students join to complete their biomedical engineering research experience: USC Viterbi School of Engineering, Biomedical Research (Microfluidics or Transducers), Image Processing and Informatics, Electrical Engineering, Bioelectronics, Biokinesiology & Physical Therapy, Preventive Medicine, and Ophthalmology. A 2 year program consisting of Medical Terminology AB (11th grade) and a two period block class taking place at USC Keck Hospital (12th grade). The program provides entry-level clerical skills in a medical environment. Students are taught the basics of phone skills, usage of general office equipment, as well as job acquisition skills. Exceptional students are offered employment at the conclusion of the program. A 3 year program in which students explore ways in which media arts production, distribution and exhibition and the media industry (film, video, digital camera, VR, etc.) intersect with STEM fields, particularly health care. Students take an English 10 Honors course (10th grade), Filmmaking 1AB (11th grade), Journalism AB or Yearbook AB (12th grade). Students in this academy are melding their emerging arts and media skills to promote awareness of all aspects of public and community health and healthcare. They create media products (public service announcements, media campaigns, documentaries, interactive presentations) with the purpose of enriching the community understanding of the benefits of heath and fitness and the how the choices people make have definitive effects on their quality of life. We have developed partnerships with industry sector partners, along with collaborations with partners from institutes of higher learning. AP Capstone is a College Board program that equips students with the independent research, collaborative teamwork, and communication skills that are increasingly valued by colleges. It cultivates curious, independent, and collaborative scholars and prepares them to make logical, evidence-based decisions. AP Capstone is comprised of two AP courses -AP Seminar (11th grade) and AP Research (12th grade)- which fulfills an inquiry based English Language Arts Program. In addition it is designed to complement and enhance the discipline-specific study in other AP courses.